Gulnara Karimova, the elder daughter of Uzbek President Islam Karimov, is being investigated for taking bribes for allowing Scandinavian and Russian telecom companies TeliaSonera and VimpelCom to operate in Uzbekistan. The Organized Crime and Corruption Reporting Project (OCCRP) has found new records that show she was far greedier and the scale of her alleged corruption was far wider than has been reported. Financial documents OCCRP has obtained detail that Karimova received more than US$1 billion worth of payments and ownership shares out of international telecom-related companies. Meanwhile, telecom users in her impoverished country pay among the highest rates in the world for mobile phone service. OCCRP found that Karimova used similar schemes on at least six telecom-related groups of companies, including those that ran fiber optic lines and provided WiFi and WiMAX services – a high-speed, long-range version of WiFi. She helped companies obtain operating licenses that agreed to meet her payment demands and she squashed those that did not, including three US companies. Her audacious schemes may have cost the people of Uzbekistan money that could have paid for pensions or healthcare but instead went into banks, an offshore hedge fund and luxurious real estate around the world including a castle in France and a penthouse in Hong Kong. Even the US$ 1 billion figure likely underestimates the true magnitude of the alleged extortion and bribery she received because most records of her business records have not been released. While the international companies involved claim to have been innocent or unwilling dupes of her maneuvers, the blatant means by which Karimova allegedly operated made it virtually impossible for those involved not to realize they were giving in to extortion and bribery. Karimova has appeared regularly in the news over the years. Once anointed as the heir apparent to her ailing father, she has fallen from favor and is now under house arrest. Uzbek prosecutors have said she operated an organized crime group that stole US$ 53 million from the state and state businesses through forgery, blackmail and extortion in running her businesses, including Uzbekistan Airways, Coca Cola, a refinery and others. Since then, her businesses have been closed and several of her proxies arrested and given short sentences. Karimova, educated in the US, fashioned herself at times as a pop star, fashion designer, international celebrity, diplomat and a successful entrepreneur, although her true skill seems to be a ruthless brand of political corruption. Former aides said she used extortion and selling her influence as the President’s daughter to get what she wanted and what she got in return was huge payments and her own share of companies. But payment records show that much like a blackmailer, she wouldn’t go away – coming back over and over again to bleed companies every time a new license was required. One US Embassy cable disclosed by Wikileaks described her as the most hated person in Uzbekistan. Karimova preferred not to run businesses but instead to take her cut and run before attracting too much attention, a former aide said. In fact, Karimova, despite her public relations image, never really started a successful business. She has yet to be charged for her activities in the telecom industry, which in terms of money, dwarf all of her current alleged crimes. Karimova’s telecom dealings first came to light in a 2012 story by Swedish Public Broadcaster Sveriges Television (SVT), followed by stories from The TT News Agency, and the Norwegian weekly Klassekampen – all working with OCCRP. They showed how Swedish-Finnish operator TeliaSonera and Russian-Norwegian operator VimpelCom paid millions to Karimova which allowed them to secure mobile phone licenses in Uzbekistan. TeliaSonera and VimpelCom are being investigated in Sweden, the Netherlands and the US. Financial documents OCCRP has obtained detail that Karimova squeezed more than US$ 1 billion worth of payments and ownership shares out of international telecom-related companies. TeliaSonera paid US$ 381 million and promised an additional US$ 75 million; VimpelCom and its Russian mother company Alfa Telecom paid US$ 176 million; the Russian giant MTS paid US$ 350 million. She also received nearly US$ 90 million from two other companies that ran fiber optic lines and provided WiMAX and WIFI services in Uzbekistan. Gunnar Stetler, a prosecutor at the Swedish Prosecutor Authority, told OCCRP a criminal indictment will be brought against one or more of the parties in the TeliaSonera case before the end of the year. Karimova used three main techniques to enrich herself, according to financial records and to people who worked with her. Sometimes she’d demand a percentage of a target company as a gift or dressed up as a fake investment in a local partner. Sometimes she demanded premium money for her personal services and lobbying efforts in getting required licenses. She also allegedly bullied executives to either go along with her plans or to risk arrest or being shut down by Uzbek regulators. She demonstrated a ruthless ability to acquire a share of ownership (her preferred rate was 26 percent) of lucrative telecom-related companies – without actually putting up any money for doing so. Language was inserted into contracts forcing companies to buy back her shares at a future date at an exorbitant profit. In late 2001 she met with Shahid Feroz, president of International Communications Group (ICG) of Atlanta. A decade earlier, ICG had set up the Uzbek mobile phone carrier Uzdunrobita through a joint venture with the Uzbek government. It became the first mobile operator in Central Asia. Her proposal to him was straightforward: give her a 20 percent stake in the mobile operation or be destroyed. 2001 was a good time for Karimova to insert herself into the telecom market in Uzbekistan. With a population of 29 million and only 128,000 mobile subscribers, the market was one of the few areas left in all of Europe and Eurasia with fast-growth potential. Russian and European companies that had grown rapidly for years were slowing down. Everyone wanted a piece of the Uzbek market, which eventually grew to 25 million subscribers by 2012. “She made it clear that, without her support, Uzdunrobita would be destroyed,” ,” Farhod Inogambaev, once one of Karimova’s closest advisors, said in an affidavit filed with a US court. She pressured the American investors to accede to her demands by getting Uzbek authorities to withhold its telecom license. Between 1994 and 2001, Inogambaev had worked in Dubai for Karimova’s former husband, Mansur Maqsudi, a naturalized American businessman of Afghan origin. Karimova had lived with Maqsudi in the US, but when the marriage foundered, she returned to her homeland in 2001. Upon her return to Uzbekistan, she had Inogambaev’s brother detained to allegedly coerce his return from Dubai to Tashkent and to ensure his allegiance to her. Until he escaped to the US in 2003, he was intimately involved in her business and personal activities. Together they set up bank accounts, established proxies and took over controlling interest in a host of companies. ICG, taking the threat to heart, agreed to transfer 20 percent of ownership in Uzdunrobita to Revi Holdings. That was a Dubai company Inogambaev set up in November 2001 in the Sharjah Free Trade Zone of the United Arab Emirates as an offshore holding company over all Karimova’s other firms. It was one of many companies the two set up as she got rolling. Two months after that coup, Karimova was back directing the Uzbek State Property Committee to also transfer 31 percent of state ownership in Uzdunrobita to her – giving her a majority share of ownership. Again, she put up no money for this. Once Karimova was in full control, “large amounts of funds in US dollars started arriving into the (Karimova) companies’ accounts from Uzbekistan,” often in the form of marketing and consultancy contracts to herself, the aide said. Through these sham contracts, where no services were actually provided, she paid herself millions and deposited them into her personal account, Inogambaev told a federal court in Washington DC. For example, in July 2002 Uzdunrobita sent a bank transfer to Revi Holdings for US$ 330,000 for undocumented “consultation services”, according to some of Inogambaev’s documents reviewed by the Financial Times. Revi Holdings also received money from Huawei Technologies, a Chinese telecommunication company that helped Uzdunrobita create a mobile network outside Tashkent as well as other telecom companies. Fearful of being caught up in what he called her racketeering, Inogambaev left Uzbekistan in 2003 with a stack of internal documents exposing her operations and that were shared with Global Witness, a British-based corruption watchdog, and the Moscow Times. Karimova’s appetite steadily grew and she refined her approach over the years. A trove of financial and banking records OCCRP has obtained show that as time passed, she started asking for more and more: first a couple million dollars, then tens of millions and finally hundreds of millions. Eventually, she managed to acquire an even larger controlling, but at the time hidden stake in Uzdunrobita, though exactly how large is unknown. In July 2004, Inogambaev told reporters, she decided to cash out and sold a controlling share of Uzdunrobita to a company outside of Uzbekistan for more than US$ 100 million. The buyer, Russian-owned MTS, one of the largest cellular providers in Europe and Eurasia, announced only that it had paid US$ 126.4 million for a 74 percent stake in Uzdunrobita. MTS negotiated with Swisdorn a three-year “put and call agreement” allowing it to acquire the stake for a minimum price of US$ 37.7 million. A put option allows a buyer to sell shares at a specified price within a fixed period. Those shares are thus protected against a loss in value. This deal made little business sense for MTS unless its minority partner was the powerful Karimova. This ploy became a hallmark of Karimova’s deals and was repeated again and again. By maintaining a minority share and selling it back at vastly inflated prices through a put and call agreement, Karimova harvested her biggest profits at a steep cost to the mobile carrier. Three years later, in June 2007, Karimova cashed in at six and a half times more than the agreed price or US$ 250 million. A similar scheme appears to have played out when Norwegian-Russian telecom company VimpelCom and its principals entered the market in 2005. VimpelCom was a joint venture of two giants: Norway’s Telenor and Russia’s Alfa Group. Alfa entered the Uzbek mobile market first in December 2004 when it bought a small, primitive 2700-subscriber local company named Bakrie Uzbekistan Telecom (known as Buztel) for US$ 4 million according to the 2005 financial statements of its former shareholder, the Indonesian firm Bakrie. In February 2005, Alfa obtained a GSM license by buying 74 percent of Uzmacom for US$ 13 million according to media reports, with the state telecom owning the rest. A small operator with just 9,000 subscribers, Uzmacom still had a valuable GSM license that covered the whole country and more valuable 900 MHz frequencies in Tashkent than all other carriers. However, as soon as it was bought, Uzmacom either didn’t pay its license fee or the state refused to accept it and the license was suspended by state authorities in August of 2005. Although Alfa publicly blamed management for the failure, it benefited from the suspension when it applied for Uzmacom’s license through its own company Buztel. Buztel was awarded the license sometime later in 2005. In the process, the state lost its share in the lucrative license. Alfa made a massive profit when it sold Buztel at the beginning of 2006 to its joint venture VimpelCom for US$ 60 million. Two days later, Alfa made a US$ 19 million payment to a Gibraltar-registered company named Takilant via Alfa’s wholly owned British Virgin Islands subsidiary called Aqute Holdings & Investments. Takilant would loom large in future deals, especially the TeliaSonera deal. Scandinavian prosecutors now say Karimova owns this company, although on paper it is owned and run by her aide, Gayane Avakyan. Takilant has served as a holding company for other Karimova deals including those involving duty-free shops, clothing businesses, and pharmaceuticals. Why Alfa’s subsidiary made this payment to Karimova is never explained but Alfa’s Buztel significantly benefited from favorable decisions by Uzbek regulators throughout 2005. 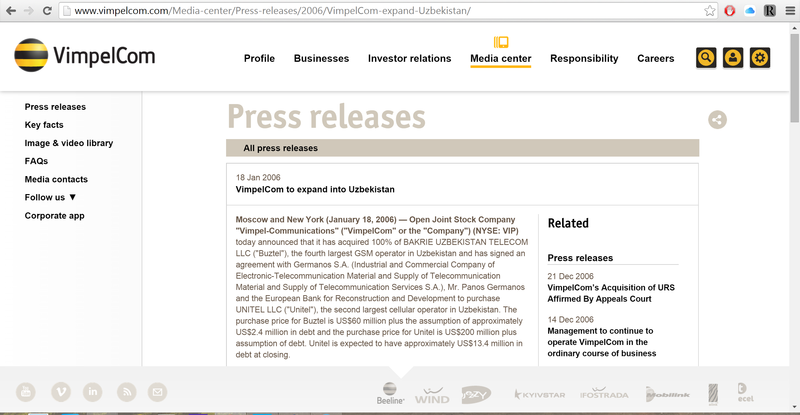 In February 2006, VimpelCom bought Unitel for US$ 200 million, one of the big remaining players in the Uzbek market. A couple of months later, it merged Buztel into Unitel. A VimpelCom spokesman at the time said Takilant consulted on the merger although how and on what terms were never made clear. 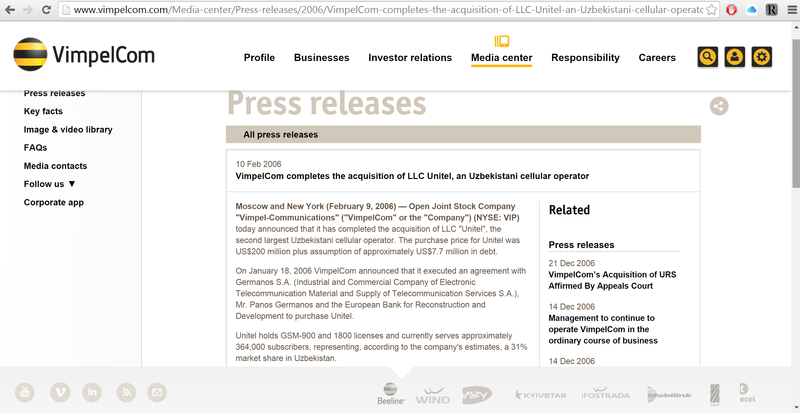 In April 2007, Karimova entered into an agreement with VimpelCom to buy a 7 percent stake of Unitel for US$ 20 million through a subsidiary. A put option allowed either party to force the sale of the 7 percent stake back to VimpelCom two years later for between US$ 57.5 million to US$ 60 million‏. Karimova exercised that option in September 2009 earning a windfall of US$ 37.5 million. Again, the terms of the deal made little financial sense for VimpelCom and it’s not clear why the firm would sign a deal so beneficial to Karimova. Recently a whistleblower told Norwegian officials that VimpelCom paid at least US$ 100 million more to Karimova. OCCRP confirmed at least one of the additional payments – VimpelCom said at least US$ 43 million was paid for a license in Uzbekistan in their 2007 filings with the US Securities and Exchange Commission. This makes little sense since the actual cost of a license in Uzbekistan is quite small. Enter TeliaSonera, the Swedish-Finnish telecom giant that also sought to capitalize on the fast-growing Uzbek market. It would follow a path remarkably similar to MTS and VimpelCom. However, because Swedish officials and TeliaSonera itself investigated the bribery allegations more effectively than Russian and Norwegian officials, more information is available. That includes a 2013 report by the Swedish law firm Mannheimer Swartling which detailed TeliaSonera’s 2007 entry into the Uzbek telecom market. It spells out in detail what Karimova allegedly did. Bekzhod Akhmedov, who managers at a TeliaSonera subsidiary described as the head of “Karimova’s investment group,” was the CEO of Uzdunrobita when MTS bought it under questionable circumstances. Akhmedov became central to many of Karimova’s deals for over five years, even negotiating deals on behalf of his rival telecom companies with Karimova. He remained as CEO of Uzdunrobita until he left Uzbekistan in a hurry in 2012. In 2007, TeliaSonera wanted to acquire Coscom, then the third-largest telecom in Uzbekistan and owned by MCT Corp., an American firm. The government had been after MCT for months, suspending its licenses and sending tax inspectors in to visit. The firm was hit with a US$ 23 million tax evasion charge. Realizing it was not going to be allowed to operate in the country, MCT opened buy-out negotiations with a number of firms. Odd barriers seemed to crop up for every potential buyer – until TeliaSonera. According to diplomatic cables leaked by Wikileaks, a Coscom director not identified by name informed the US embassy that he believed the government’s legal moves might be orchestrated by the president’s daughter seeking personal gain. Pressure and the threats of new lawsuits died away when TeliaSonera began negotiating with the government, he said. As the negotiation continued, though, another secret deal was taking place. Akhmedov’s assignment was to ensure that Karimova would have a stake in TeliaSonera’s Uzbek investment. Days before TeliaSonera was to buy MCT and get Coscom, Ahkmedov and TeliaSonera signed an agreement. Coscom needed 3G licenses to succeed in Uzbekistan. The agreement stipulated that a local partner would transfer its licenses to Coscom for US$ 30 million in cash and a 26 percent share in a new joint entity. Though the agreement was signed, there were several legal problems with it. According to Uzbek law, frequencies can’t be transferred. And no local partner existed, much less owned licenses. According to the agreement, an Uzbek partner would set up a firm in the British Virgin Islands, which in turn, would set up an Uzbekistan subsidiary. Instead, in late 2007, Akhmedov informed TeliaSonera that its local partner would be Takilant, which Karimova owned and her aide Guyane Avakyan ran. Avakyan signed all contracts at a distance and never negotiated deals directly with TeliaSonera. Takilant then established Teleson Mobile, a fully owned subsidiary which by the end of September had obtained all needed licenses, despite, like its parent Takilant, having no experience in the telecom business as required by Uzbek regulations. TeliaSonera and Takilant signed shareholders and 3G agreements allowing Takilant to become a shareholder in their joint venture. There was one condition – that Teleson Mobile would surrender its license. As soon as Teleson did this and Coscom obtained it from the Licensing Authority, TeliaSonera paid. Instead of just giving Takilant 26 percent, TeliaSonera paid US$ 80 million, and Takilant wired back US$ 50 million the same day. The exchange, leaving Takilant with US$ 30 million, made it look like Karimova had paid for the 26 percent although she essentially had received both the ownership and the money for free in exchange for arranging the license transfer. She later sold 20 percent of the company for US$ 220 million. She still holds a 6 percent share in Coscom that she could sell for at least another US$ 75 million according to Takilant’s contract. While Karimova made a fortune off the sale of her ownership shares in various companies that she obtained for little or no money, she regularly took large sums of money directly for obtaining and renewing various telecom licenses. Telecom companies paid to Takilant and her other companies more than US$ 200 million between 2006 and 2011. OCCRP is aware of details from only two of her companies which may mean there were more payments. For example, TeliaSonera paid Takilant US$ 30 million initially to enter the market with a 3G license, paid another US$ 9.2 for more telephone numbers in 2008, paid off a US$ 15 million debt of another company in 2010 at the same time they got a 4G license, and paid US$ 55 million for additional frequencies and access to fiber optic networks in late 2010. In the last two payments, the license and frequencies were voluntarily surrendered by Uzdunrobita for TeliaSonera’s benefit. VimpelCom paid more than US$ 75 million in the same way. But these were not the only companies. The records also show that Eastwell SA and Eastwell Invest Holding, two holding companies based in the US and Luxembourg, made payments to Takilant and Finex, another Karimova-owned company, in 2006 and 2007. Together the two Eastwells form the Eastwell Group, a murky company that refused to talk to OCCRP reporters. A check of Eastwell’s original corporate owners from 1994 reveals that at least two of them never existed, according to official emails from the business registries in Ireland and Malta. Some shareholders and directors have appeared over the years involved in everything from arms smuggling to tax fraud. Eastwell paid at least US$ 3.8 million for technical support and consulting to Karimova’s companies. It was one of the original founders of Uzdunrobita along with East Telecom, the largest digital communications operator in the country, and Super iMAX, a wireless broadband provider. Eastwell sold its shares in East Telecom and Super iMAX in 2007 to Sumitomo Corporation from Japan and KT Corporation from South Korea. Eastwell Group says on its website that it is a holding company that provides investment capital and new technologies to businesses in CIS and Central Asia states. It has businesses in telecommunications, gas, energy, and industrial projects in the Russian Federation, Ukraine, Croatia, Turkey, Uzbekistan, Tajikistan, and Georgia. And these are not likely the only cases where Karimova received payments from telecom companies. Other payments to offshore companies have not been adequately explained and businesses working with Karimova’s companies often made very bad business decisions for themselves that profited her. For example, Karimova got more than US$ 350 million in payments from the Russian telecom company MTS when it took over Uzdunrobita based on records and court testimony. But she may have gotten more. In a May 2009 filing with regulators, MTS disclosed that it had paid a US$ 21.2 million deposit to Tammaron, a BVI-registered company whose owner is not known. MTS managed to secure a license from Uzbek regulators shortly after it wrote off its debt but not before making an additional US$ 40 million payment to a Karimova-associated business. In September 2009, MTS paid the money to buy Kolorit Dizayn, a company allegedly providing “outdoor advertising services” in Uzbekistan which was owned by Karimova’s boyfriend. MTS in its own filings shows that it valued the company at just US$ 13 million or one-third of the price it paid for Kolorit. Then there is the mysterious case of Merkony. Karimove controlled Takilant and Finex through proxies. Takilant is formally owned by her employee Gayane Avakyan and Finex by Ekaterina Klyueva. Klyueve was a secretary in UK holding company which was owned by Takilant. Gayane and Klyueva worked together in Karimova’s House of Style. Both have since been detained by Uzbek authorities. Between 2006 and 2008, a BVI company called Merkony Investment Group made US$ 85.7 million in payments to Takilant and another Karimova company called Finex, which is registered in Hong Kong. The payments, according to paperwork, were made for WiMAX and fiber optic services. However, neither Takilant nor Finex were allowed to provide such services in Uzbekistan. It is not clear who owned Merkony, which was founded in 2004 and dissolved five years later. Merkony’s director is listed as Oleg Sviridov, a lawyer working for MTS and the right-hand man of Uzdunrobita CEO Akhmedov, Karimova’s representative in the TeliaSonera deal. 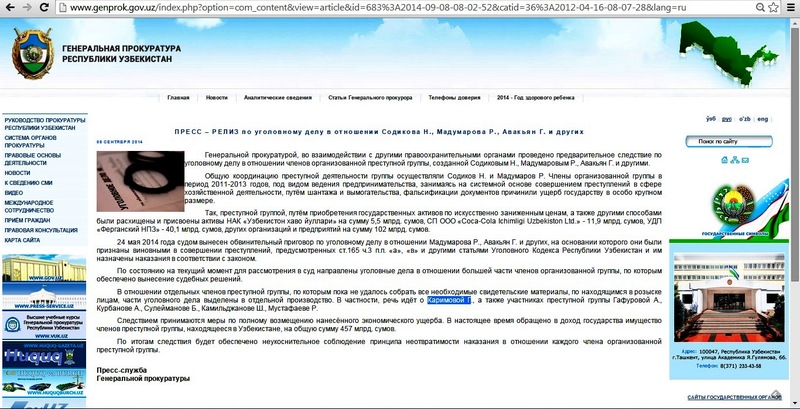 Svirdov’s name, meanwhile, shows up in leaked documents as being on the payroll of Karimova’s Takilant. Attempts to reach Sviridov and Akhmedov were unsuccessful. Karimova did not just make money initiating these deals. She appears to have continuously bled her victims through extortion. In May 2013, Swedish reporters revealed leaked documents that show TeliaSonera being asked to pay hefty sums for protection from government agencies and for an infusion of new clients. Karimova directly asked for US$ 15 million to protect TeliaSonera against five regulatory bodies: the state tax inspectorate, customs officials, the anti-monopoly committee, the state communications inspectorate, and the Interior Ministry. Payments on a per-agency basis were possible, the documents show, but at higher rate. Ultimately, telecoms were just a part of Karimova’s activities. She was involved in airlines, shipping, cement, export-import, fashion, pharmaceuticals and other industries. If she was as rapacious in those industries as she was in the mobile phone business, the amount she allegedly stole may be far above the US$ 1 billion figure OCCRP found and the losses to the Uzbek people may never be known. Editor’s note: Reporters and researchers who contributed to this story include: Lejla Camdzic (OCCRP), Dragana Peco (OCCRP), Olesya Shmagun (OCCRP), Inga Springe (Re:Baltica), Fredrik Laurin (Sveriges Radio), Joachim Dyfvermark (SVT), Alisher Siddiq (RFERL), Farruh Yusufiy (RFERL), and Hamoud Al Mahmoud (ARIJ). OCCRP wishes to thank SVT’s Uppdrag Granskning for their assistance.